← 29. Down to the Mediterranean with Paul and Jean. Having made preparations for Karen’s arrival, we then had to solve the problem of finding a suitable mooring for when Peter went away a couple of days later. 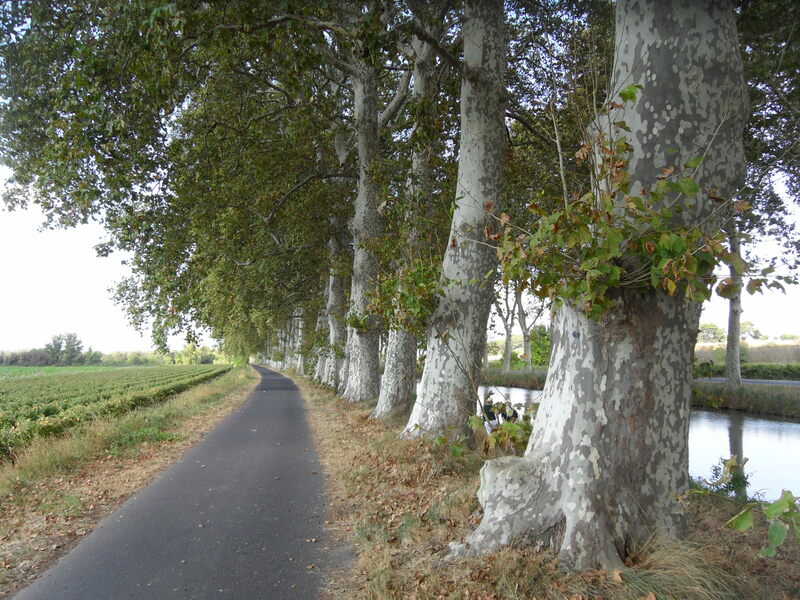 With this in mind I drove and he motorcycled to the pontoon at Bessan on the River Herault which we had earmarked as our first choice. A largish Belgian cruiser took up a fair bit of the pontoon. They informed us that the pontoon was only in place for the summer and was to be removed at the end of the week. 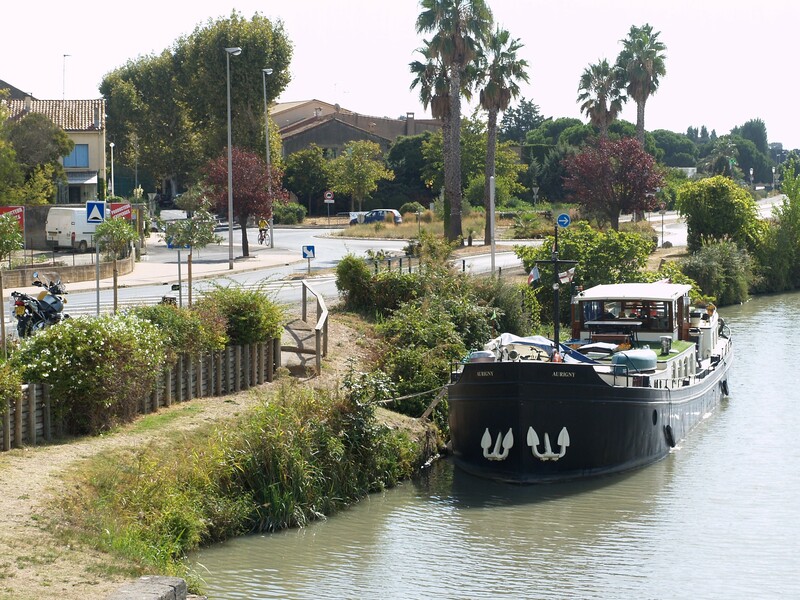 Onto choice two- which was a wild mooring on the section of the River Herault below Agde, where we had stayed several times in the past. Unfortunately the available space was now filled with long term moorers. Our friends Sue and Allan were in the Allemande boatyard painting ‘Whisper’s’ hull, so we stopped by to see how they were getting on. 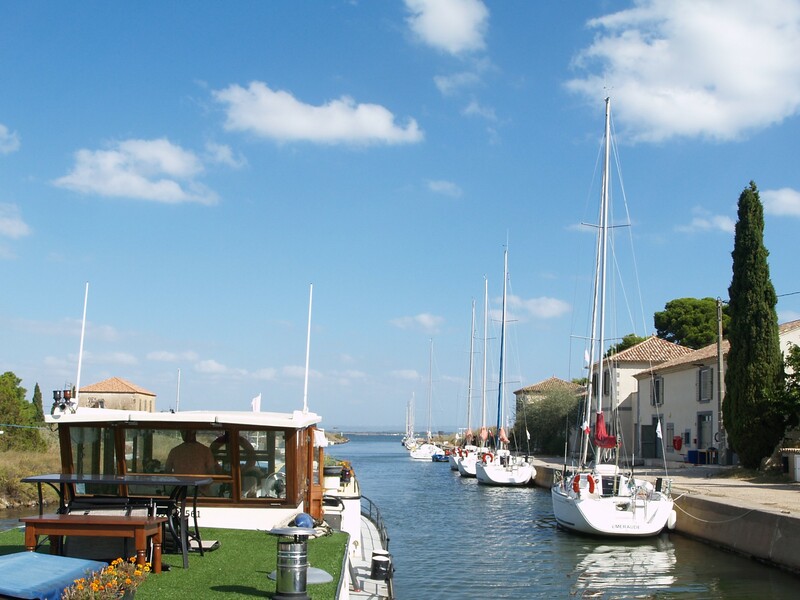 We left the motorcycle near the round lock at Agde and then returned to Frontignan no closer to finding a mooring. I headed off to meet Karen, who arrived at Montpellier Airport bang on time and despite my unexpected detour to the rental car park, I made it to the arrivals gate. We enjoyed a good catch up on deck while drinking aperos, but it was too chilly to eat outside. Autumn had arrived. 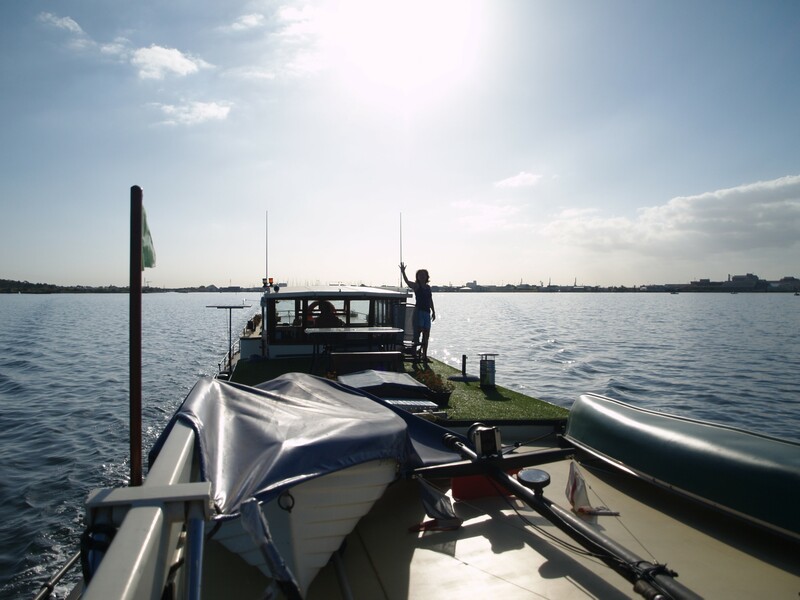 The next morning, we set off for the Etang de Thau just after 9am. The wind was light and the sun shone. In just over two hours we were cruising into the Canal du Midi and rapidly lowering our aerials at the first low stone bridge. Heading out onto the Etang. The lighthouse at the entrance to the Canal du Midi. As it was eight years ago, the canal is still lined with old derelict cruisers, many of them partly submerged. We had to avoid an abandoned half submerged catamaran on the bend before the first oval lock, but made it through ok. Slow going up to the first lock, nearly lost the aerials at the first bridge ! Vias was our destination, but alas much of the bank was filled with long term moorers. The only other space was taken by private boats. It was the same at Port Cassafieres. Eventually, we found a spot at Portiragnes lock, where the friendly lock keeper agreed to let us stay for a few days. It proved to be a perfect spot after we had sorted the ropes and achieved full sun on our solar panels for much of the day. The following day proved rather awkward as we had to collect both the motorcycle from Agde and the car from Frontignan. There were no buses from Portiragnes so we all went by taxi to Agde and then Peter returned with the motor cycle to prepare for his trip the following day. 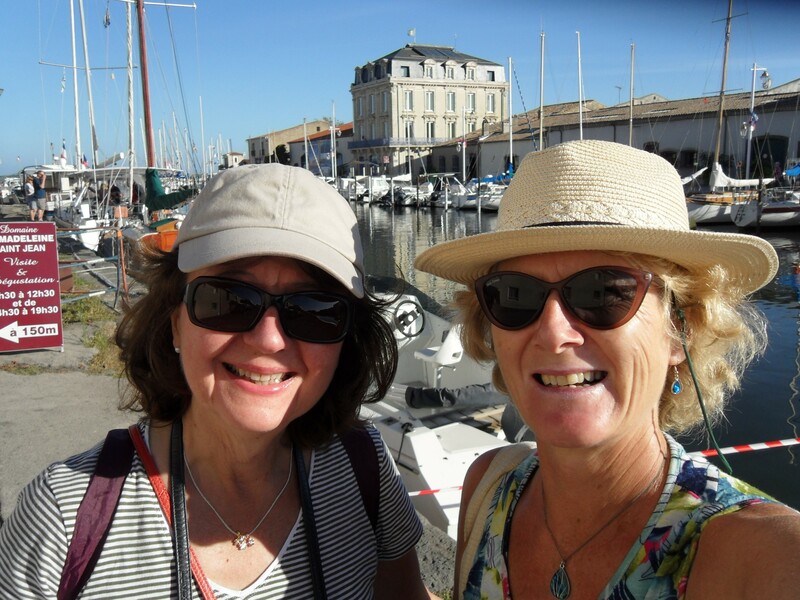 Meanwhile Karen and I walked to Agde station to catch a train to Frontignan. We had time before the train and enjoyed a stroll around the market and coffee before returning to the station. Alas, our train was delayed an hour! Undaunted, we walked back to the town centre and along the river, stopping for a beer on the way back to the station. Just as we were about to board the train I had a ‘bad Eureka’ moment as I realised that I had forgotten to bring a car key! It would have been sensible to stay at Agde, contact Peter and wait for him to bring the key, but in the panic we headed off to Frontignan on the train with me frantically texting and phoning him as we went. Peter in the meantime was still out riding, recce-ing possible moorings further west, but eventually I received his response – ‘Dipstick’ What a relief! He would bring us the car key in about half an hour. After a roadwork/route barre delayed trip Peter arrived and Karen I drove off to have a look at Sete. 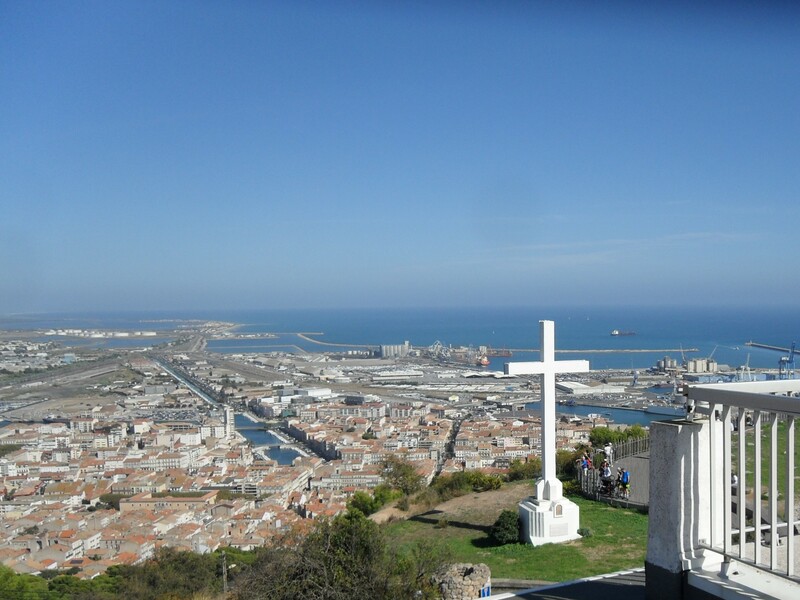 Sete is always very busy with cars everywhere, but I knew there were great views to be had from the hilltop across the Etang de Thau. We drove to both Panoramic viewpoints (St Clair and Pierres Blanches) and had a tasty Salad Nicoise as a late lunch. Looking over towards the start of the Etang. Clearly over the guilt of forgetting the car keys ! Our rather frustrating day had turned out fine. 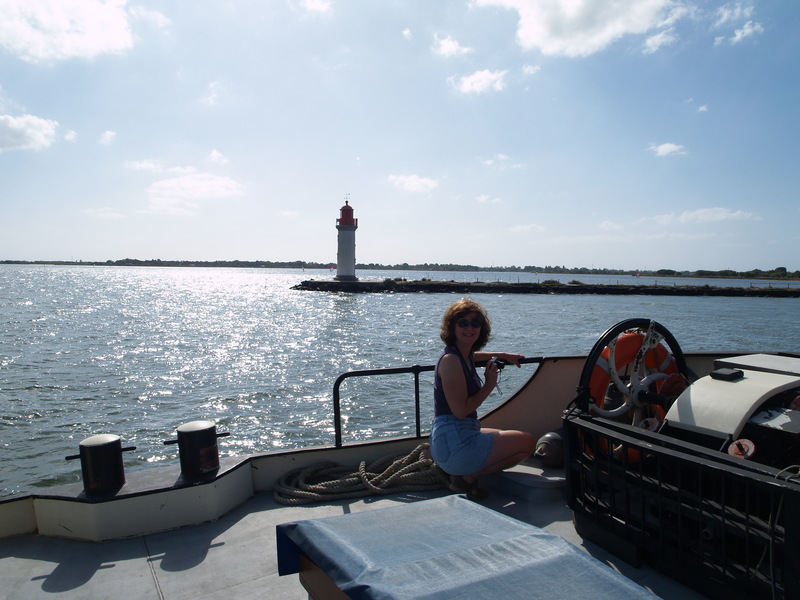 We drove back to Agde along the sand spit which separates the sea from the lagoon and made a short detour to the pretty port of Marseillan, before returning to the barge. Peter left at 9am the next day for his trip north and Karen and I had a lazy start. 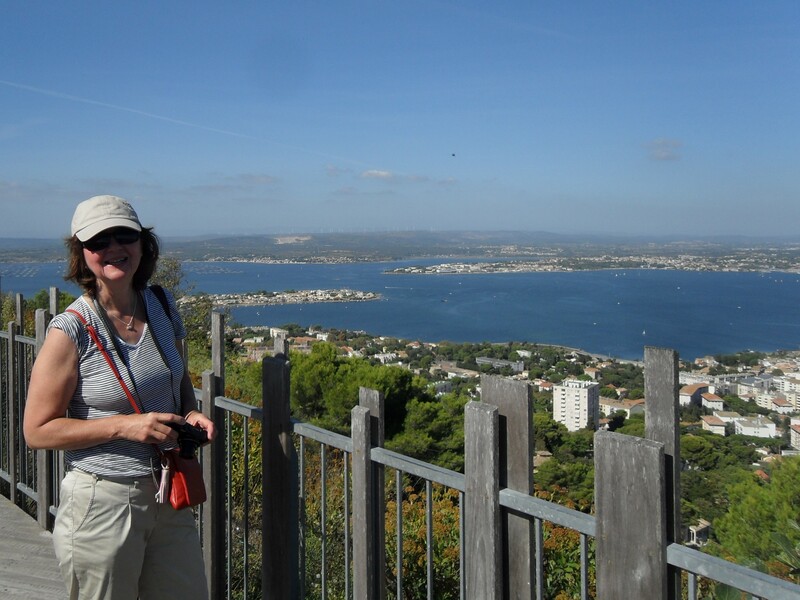 We drove back to the Etang de Thau and enjoyed a coffee in Bouzigues before exploring the town. Our next stop was Meze where we had a snack lunch on the beach before swimming in the rather murky waters. Finally we drove to Marseillan where a large beer on the quay and then a fine meal of tuna steak followed by fig pudding ended a fabulous day. Darkness was falling quickly now and our new sat nav (James) took us to Portiragnes Plage. We eventually reached the barge at gone 10pm. We spent the weekend enjoying the continued good weather at one of three Portiragnes beaches and visiting Villeneuve les Beziers by car and on foot for the inevitable large beer. Lots of hire boats were still ploughing up and down the canal which doesn’t seem to have lost its popularity despite the removal of so many Plane trees. There are some stretches where the trees still grow, but these are rare. The VNF has replanted a variety of saplings along the banks but it will be many years before the canal regains its character. Curious how some of the trees were unaffected. Monday 1st October dawned sunny but with a chilly wind. A drive to the pleasant town of Pezenas was an ideal excursion. The town has lots of craft shops and workshops and thankfully some restaurants. I was treated to a tasty galette in the old town before we returned to Portiragnes. Peter returned that evening having enjoyed an interesting few days riding with his old colleagues visiting the memorial/Martyred town of Orador sur Glane, a tank museum and the dock and submarine pens at Saint Nazaire. Not wanting to overstay at the lock, we shuffled the motorcycle up to Villeneuve les Beziers the next morning, before dropping a bottle of wine to the lock keeper and heading off once more. Despite being quite busy with hire boats, we were pleased to find space behind Bill and Jane (‘Arran’) who we met at the Dixmuide DBA Rally back in in 2014. We caught up over aperos that night and then said ‘au revoir’ the next day as they left for their winter mooring in Toulouse. After a last stroll along the canal towards Bezier, I drove Karen to the station from where she took a train, a tram and a bus back to Montpellier airport. We had enjoyed a lovely week together. No sooner had Karen left, than a freshly painted ‘Whisper’ turned up and was soon moored up on the opposite quay.